Defenseman Sami Lepisto, recently called up to the Washington Capitals from AHL Hershey, has appeared in NHL five games and tallied an assist, his first NHL point, on a goal by Brooks Laich against the Thrashers friday night. Even though Hershey Bears defenseman Sami Lepisto never had been to the Hockey Hall of Fame before, he knew right where to go when he visited the shrine during a recent road trip to Toronto. Lepisto made a beeline to the display honoring Jari Kurri, an all-time great who also happens to be Lepisto's godfather. The fellow Finn is a good friend of Lepisto's father, a former player on that country's national team. "It was nice to see his name on the Hockey Hall of Fame," Lepisto said. "I was like, 'Hey, that's my godfather.' I was very proud. It's a great thing for him, and a great thing for Finnish hockey." A generation later, Lepisto is well on his way to giving his country and family more to beam about. Lepisto is a first-year AHL player, but he's not a rookie; his four seasons in the Finnish Elite League gave him too much experience to qualify for that category. The Bears don't need to crack a rulebook to know Lepisto, 23, is nothing like a real rookie. All they have to do is check out his stats. His 37 assists reflect poise with the puck far beyond his years. His plus-27 rating, tied for second in the AHL, is a nod toward defensive maturity. Put another way, the slick Lepisto is an AHL newcomer who just happens to excel in two of the toughest areas for young players to grasp. 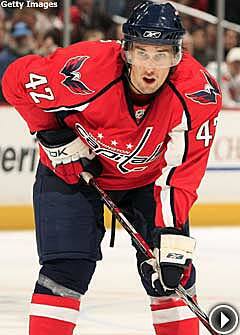 He's been recalled to Washington four times in the past month, most recently March 14. In four games with the Caps, he has one assist and six penalty minutes. "I don't know if you can ask much more out of a young defenseman," said Hershey coach Bob Woods. "He's a rookie, but he hasn't played like a rookie." Lepisto doesn't see or talk to Kurri all that much, save for the occasional round of golf in the summer. But he's still been around enough over the past several years to view Kurri's experience as something that should be picked up through osmosis. Lepisto's stretch with Jokerit Helsinki tossed him into the mix of one of the best elite leagues in the world, one loaded with much older players. "He's used to playing with men," Woods noted. "It's very similar to North American style," Lepisto said. "I got to play much. I was expecting to do well (in the AHL). I feel pretty confident." Once with the Bears, Woods paired Lepisto with veteran Josef Boumedienne, 30. The two have been inseparable, with Boumedienne tutoring the newcomer on everything from getting a driver's license to managing his financial affairs. It was Boumedienne who imparted some hockey history on his buddy by escorting him through the Hall of Fame. "It seems like he's enjoying life every day," Boumedienne said. "He never complains about anything." Then again, what's there to bark about? Not skating ability. Lepisto, a third-round pick by Washington in 2004, has the jets to create a one-man fast break. "He can create something out of nothing," Woods said. "He can crank it up pretty good and leave guys behind. In the (offensive) zone, he's tough to contain. He's good at jumping into the holes and jumping around guys." Certainly not ice time. Lepisto has gained Woods' full confidence, earning minutes on the power play, penalty kill and late-game situations. With the way Lepisto sets them up in scoring positions, his teammates are grateful to see him flying over the boards so often. Woods invoked the name of former Bear and current Caps defenseman Mike Green as a fair comparison when it comes to Lepisto's offensive ceiling. "If you play with really good players and give the puck to good players, you get assists that way," Lepisto said in a deceptively simple self-scouting report. "That's always been my game -- create plays, drag guys to me, make a play to someone else." As good as Lepisto has looked, the most impressive thing about him might be how pliable he is in terms of learning more. Boumedienne marvels at his coachability. "The coach tells him to skate 100 laps around the rink, he'll be like, 'All right,"' Boumedienne said. "It's part of the whole Finnish mentality," Lepisto said. "You are a worker. What you do, you do 100 percent. It's easier not to complain. I don't think there's a coach I haven't gotten along with. If a coach wants something, I try to bring it." That dedication doesn't leave much time for diversions. The Hall of Fame trip fit neatly into an opening in his schedule, and he had extra incentive to stroll its halls. A much different type of North American landmark remains uncharted territory for Lepisto. Just a few strong sniffs away from the Bears' Giant Center is Hersheypark, with its addicting chocolate smell wafting across a huge parking lot and banging on the arena doors. Lepisto said he's resisted the chocolate factory's siren call … so far. "I have to admit, I haven't been there once," he said. "I have to do that later. I haven't had time to go there. I do have a bit of a sweet tooth. I do like to eat candy and chocolate. I have to try to get there."